Another new restaurant for the ole 30 list! No. 246 in Decatur (and you really can’t go wrong in Decatur). The restaurant is very trendy – open space, open kitchen, great patio (though it was rainy when we were there). The pasta is homemade and they were making it while we were there! They have a great wine selection, including the most interesting descriptions of wines I have ever seen: approachable; saddle; seductive. I was told by numerous people that the cocktails are amazing – but it was a Monday night, so I opted for the wine. The menu is small but diverse and delicious. You start with a crispy, warm bread with olive oil. Then I had the Agnolotti pasta – I’m still not sure what kind of pasta it was, but it was tossed with asparagus, ricotta, tomato filetto (sauce – I had to look it up), pine nuts, and lemon. It was delicious. This would be a great date night, fun birthday or celebration dinner, girls night, anything! I also just read on the website that you can reserve a the chef’s counter: sitting right at the kitchen for a 5-course dinner by the head chef. How fun would that be?! 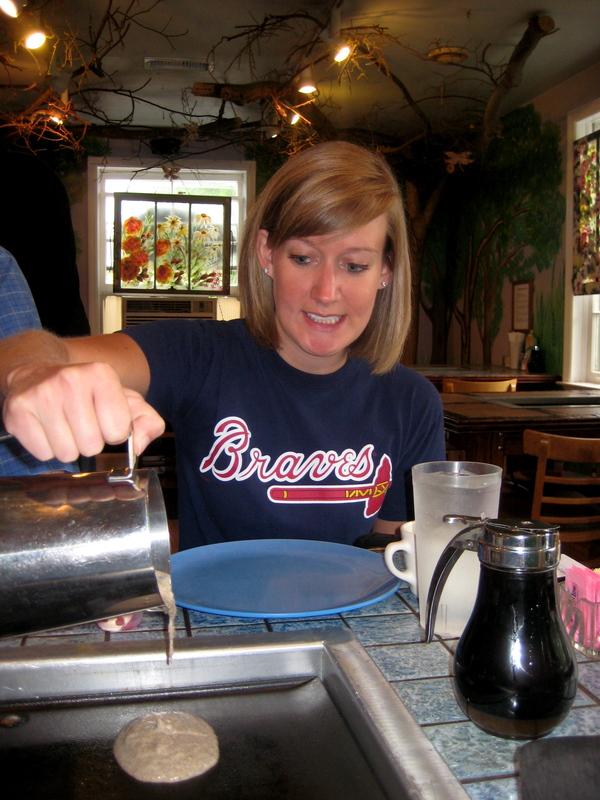 Categories: Thrilling Thursday | Tags: 30 before 30, Atlanta, decatur, restaurants | Permalink. I’m not going to lie – I love food. So new restaurants is definitely one of my favorite things to check off my 30 before 30 list. But, as I believe I’ve said before, it’s sometimes difficult to make yourself go to new restaurants or take the time to research in order to find a new restaurant. Luckily all the local deals sites make it a little easier. A while ago I bought a deal to The Barrelhouse (and finally used just before expiration). It’s on Tech Square (Georgia Tech, that is) so I expected it to be a typical college bar. That’s not a good or bad thing. But on a Monday night it was a very cozy and quiet. There are a lot of TVs and they have a diverse menu, with some good weekly specials (for example, Mondays are burger and a pint night for $6) and a large drink menu (beer, wine, and cocktails). I had the fish n’ chips – great breading on the fish and very good tartar sauce. My friend had the fried chicken & grits – of course I had a bite and it was delicious. If you’re looking for a new laid-back, easy weekly dinner I definitely recommend it. I assume the weekends are more busy and attract more of the nearby college crowd, but I may be wrong on that! Categories: Thrilling Thursday | Tags: 30 before 30, Atlanta, food, restaurants | Permalink. It was a beautiful Easter weekend in middle Tennessee – though slightly cooler than it has been the past couple of weeks. My parents hopped up from Atlanta for the holiday weekend – my first Easter with family in maybe 7 years! When my parents come to visit I try to find new things to do – most of which is trying new restaurants. And even though I’ve been here 7 years, there are still plenty of news ones that even I have not made it to! They got in Friday night and we just grabbed a quick dinner at our favorite local Mexican restaurant – Las Palmas. I frequent there but have never taken them there! Saturday was our big day, and every big day needs a big meal to start out. And I’m not sure anyone does big meal better than Monell’s. None of us had ever been though it’s been on my list forever. Imagine all-you-can-eat family-style southern cooking. Now whatever you are thinking, multiply by 3. Yep, that much food. Biscuits, cinnamon rolls, cheese grits, potatoes, corn pudding, fried apples, eggs, pancakes, sausage, bacon, ham, fried chicken [they are known for their fried chicken and serve it at every meal]. I think that was everything?? Definitely a place to add to your list in Nashville (and 9am on a Saturday was a perfect time to go)! We continued the food tour that night at Edley’s BBQ. My dad’s favorite food is BBQ and Edley’s a new place not far from our house in 12th South. Order at the counter – all I’ve had is the pulled pork platter but it’s all I need. Add 2 sides – they’re all good. Comes with a hunk cornbread – arguably the best cornbread I’ve had. Oh, and we had fried pickles because my daddy and I are obsessed with friend pickles. And they’re amazing there. All the food has it’s own unique flavor and it was a great addition to the 12th South family. We rounded out the foodie weekend with Easter brunch at Mad Donnas in East Nashville. No special menu. No $40 a person brunch buffet. Just the normal fantastic brunch menu and 2-for-1 mimosas in various flavors. I’ve taken them there before, but it’s an easy Sunday brunch and I’ve never had to wait for a table (even on Easter). I did have something new though – the Crab Cakes Benedict – and it was amazing. Sooo good. Don’t know if it will replace my normal Fancy Ham Sammich but it was definitely worth getting. Mad Donnas is by far my favorite brunch in the city! Categories: Merry Monday | Tags: Easter, Edleys, Mad Donnas, Monells, Nashville, restaurants | Permalink. My last new Nashville restaurant to complete #51 on my 101 list!! We ventured over to East Nashville to meet some friends who live there and they suggested Rosepepper Cantina. I had so many good things about this restaurant, it was an easy yes. The patio is huge and cozy. The margarita is one of the best I’ve had, made from scratch. For my meal I had fish tacos which were also very fresh – and the tortillas were the same as we get in Guatemala. All pretty authentic in my opinion. Would definitely recommend it and will definitely go back! Categories: Thrilling Thursday | Tags: 101 in 1001, Nashville, restaurants | Permalink. New restaurant 9 of 10 on my 101 list!! I love breakfast. Breakfast is definitely my favorite meal of the day. If I could eat a huge breakfast every day, I would. Again, parents in town so have to try new things. 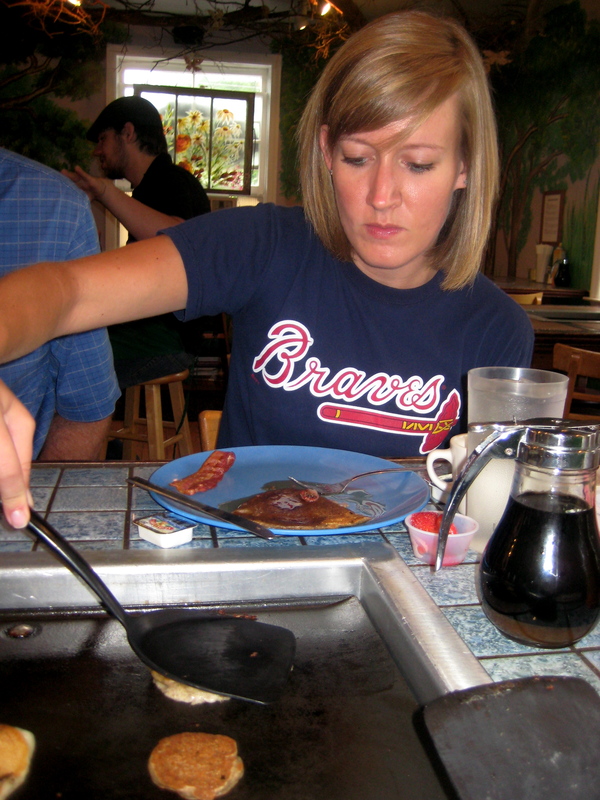 I’d been hoarding a Groupon to the Pfunky Griddle, which may have the most unique dining concept ever: cooking your own breakfast. Yes, that’s right. The restaurant is an old house with tons of character, filled with tile-top tables with a small griddle in the middle. 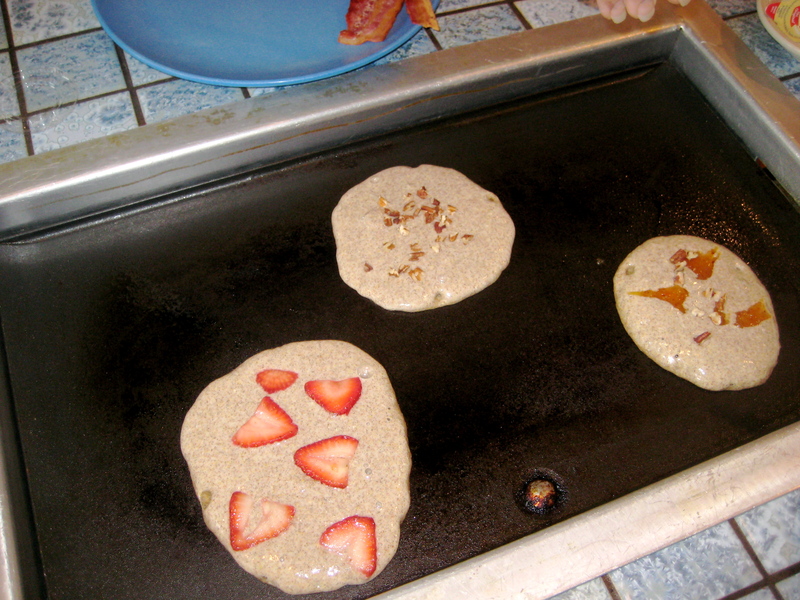 Order your all-you-can-eat pancakes and choice of topping, let the griddle heat up, and flip away! You get 2 batters: unbleached white and organic 5 grain. The 5 grain is absolutely delicious, though my dad, ever the traditionalist, loved the white. Fun experience and good food! Categories: Tickled Tuesday | Tags: 101 in 1001, breakfast, Pfunky Griddle, restaurants | Permalink.